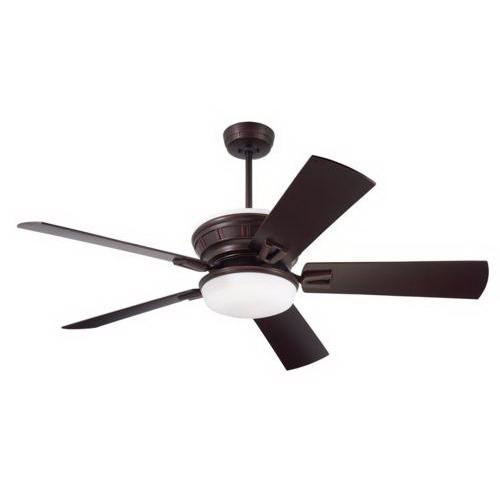 Emerson Portland Eco ceiling fan comes with three 50-Watt halogen lamp. It has five 54-Inch blades in dark mahogany/walnut finish that compliments any decor. Fan features venetian bronze finish housing for corrosion resistance. Blade has pitch of 18-degree. This 6-speed wall control fan has flow rate of 6389 CFM at high-speed. It features opal matte glass shade. Fan has DC motor for efficient performance. It has voltage rating of 120-Volts and current rating of 0.28-Amp at high-speed. It is suitable for indoor use. It has power rating of 33.5-Watts at high-speed. Ceiling fan is UL listed.